Along with the cold weather, there are a number of special challenges that winter brings along with it, and we all have to just deal with them! Dry skin, chapped lips, stuffy noses, darkness at 4PM, winter storms, the list goes on and on. One of the most annoying things by far is clearing walkways and driveways of snow and ice. The same goes for cars, but while you can often drive through a little bit of snow, you can't with an ice-covered windshield. Not only is it illegal to drive with an obstructed view, it's also insanely dumb and extremely dangerous. This rubbing alcohol spray is the perfect thing to have on hand for freezing cold mornings and icy windshields. You can leave the bottle in your car and it won't even freeze, unless it gets well below zero. That's because the freezing point of isopropyl alcohol is -128.2 degrees Fahrenheit, so when you spray it on the ice, it doesn't freeze up. Instead, it helps to melt the ice and keeps it from re-freezing. 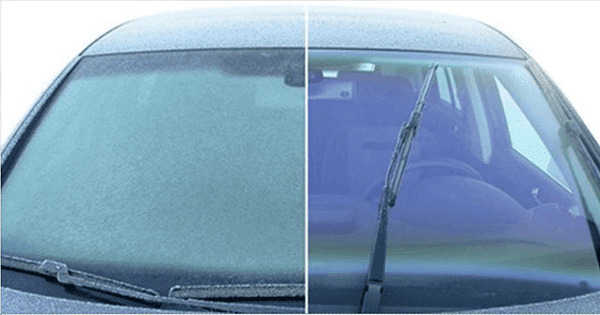 Since all you have to do is mist it on, it's by far the quickest and easiest way to clear a windshield that's coated with a thick layer of ice. Don't forget to check out the video to see exactly how well this works in action and be sure to pass it along to those who could use the smart tip. If it can make someone's life a little bit easier this winter, then it's worth it!